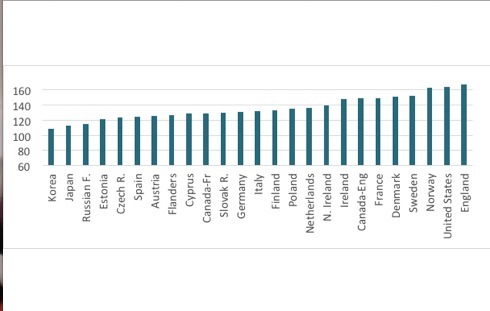 The latest OECD Survey of Adult Skills (SAS) generated much commentary on the relatively poor level of adult skills in England – particularly the revelation that on both literacy and numeracy tests young people scored no better than older generations and worse than their peers in all other countries except Italy and Spain. There was less discussion about how skills are spread around the population, but this is just as important. On this dimension the news is no better, because the distribution of adult skills in England is very unequal. There is a larger gap in literacy and numeracy scores between the highest and lowest achievers than in most other countries and the impact of parental background on skills attainment is stronger than in most countries. Despite some evidence of a narrowing in the dispersion of skills in England over the last 16 years, the skills of the youngest cohorts are still more unequally distributed than in almost all other countries. There are large gaps in the skills of the 16-65 year olds, particularly in numeracy. Scores in SAS are measured out of 500 but the actual range of scores is much lower. In England the average score in numeracy of those in the lowest-scoring 20 percent is 153 points below the average score of those in the highest scoring 20 percent. The gap in literacy scores is somewhat smaller at 134.3 points. Only two countries, France and the USA, are more unequal in numeracy and in literacy only Finland and Canada are more unequal. However, the situation for the younger age groups is even more alarming. For the 25-29 year olds there are no countries with more unequal skills distributions in either numeracy or literacy. England is also the only country where skills are as unequal amongst the younger age groups as the older ones. England also does relatively badly on equality of opportunity – in terms of the degree to which social background influences skills attainment. The only country where the parents’ level of education has a greater effect on children’s skills attainment in literacy and numeracy is the Slovak Republic. Young people with graduate parents are likely to score 67 points higher in numeracy and 58 points higher in literacy than those whose parents only have GCSE level qualifications. English-speaking, ‘liberal’ countries generally show less equality of opportunity than other countries, and England and the USA the least. Why are adult skills in England so much more unequal than in most other countries? Some possible explanations can be ruled out. Differences between age groups play no part in England since the skills levels of younger age groups are much the same as for older age groups. Inward migration seems to contribute a small amount to adult skills inequality in England but no more than in most countries and rather less than in some. Adult learning does not appear to play a greater role in exacerbating the skills inequalities amongst adults in England than in other countries. However, there is one likely explanation and that has to do with initial education. Skills and educational qualifications are very closely related. In England, each of the different age groups has a very high level of inequality in education qualifications compared with other countries. Since most qualifications are achieved before the age of 25 this implies that the initial education system has been producing very unequal outcomes going back to the 1950s. Our research (pdf) concludes that the primary cause of adult skills inequality in England is the exceptionally unequal skills outcomes of the initial education system sustained over a long period, fuelled and supplemented by an especially strong influence from social background. ‘Fuelled and supplemented’ catches the process well. Until there is a genuine and widely shared desire to change this interrelation of education and class, little real progress will be made in reducing inequality of attainment – or of anything else.